Motorist Tabitha Ormaechea was stopped at a red light in Spokane, Washington when she was struck by another, slow-moving vehicle. Although damage was minimal and no one was injured, Tabitha was surprised to discover that the other driver wasn't a person at all -- but rather, a pint-sized chihuahua, presumably an unlicensed one at that. "When I looked up, there was no one in the car, just a little dog up on the steering wheel peeking over looking at me," Tabitha told KREM News. "I was shocked, I didn't know if I was crazy, or if this little dog had taken a joy ride." She wasn't crazy. 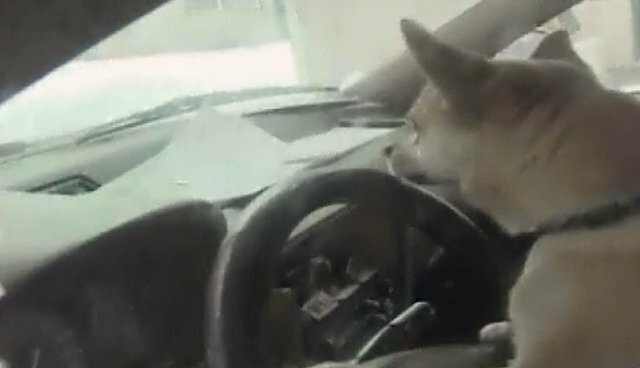 Evidently, the little dog had managed to commandeer the car after being left alone by its owner, Jason Martinez, who was shopping in a nearby store. The joyride came as an equal shock to him. "He must have knocked it out of gear and the car rolled out," says Martinez Thankfully, the crash was so minor that both occupants and vehicles were unscathed, though such an incident could have easily gone the other way. Last March, a Pennsylvania pedestrian was injured in after a dog, left unattained in a car, bumped the vehicle into gear, trapping the victim between him and his truck. Currently, only 14 states -- not including Washington or Pennsylvania -- have passed laws prohibiting dogs from being left alone in vehicles, though primarily for dangers associated with extreme heat or cold. But if that alone isn't enough to inspire sensible legislation for pet safety, perhaps the threat of joyriding canines causing accidents will.